I know exactly what you mean… I have plenty of “guilty pleasure” songs by bands that I have little to no respect for. And this song is a perfect example! I feel the same way about fun., but this song is definitely catchy. 🙂 Thanks for sharing it! Haha, glad you enjoyed! Yeah, fun. is a definite guilty pleasure for me. This is a cute song. I like fun. but haven’t listened to the whole CD yet. I don’t even know which album this song is on…I only know the fun. songs that have played on my local radio stations. But yeah, hype really turns me off! It took me FOREVER to read Harry Potter because everyone was raving about the series so much! Thanks for sharing this song. I guess I must have skipped it or something, because I don’t remember it from the album. I was underwhelmed by it when I listened to the whole thing. OH! 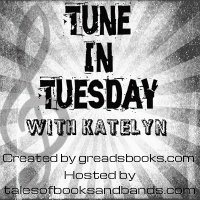 I also forgot to link up my post, but here’s my Tune in Tuesday, too! Good to know about the fun. album…not that I was planning to buy it, but I’m glad to have that decision validated! 🙂 I’ll probably get to THG eventually…maybe in 5 or 6 years when everyone else has calmed down!